For sure, nowadays the air we breathe, the water we drink and the land we walk on is no longer 100% pure as it was before. Do you want to go back to the days when everything was natural? Well we cannot go back in time, but good news! We can revive the nature by making a difference today! 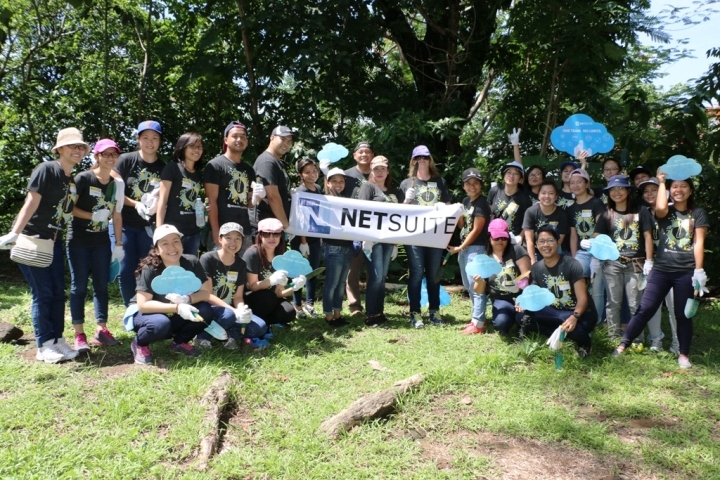 Netsuite Philippines Inc. joined an environmental activity of ABS-CBN Lingkod Kapamilya Foundation Inc-Bantay Kalikasan at the La Mesa Ecopark, Quezon City. That was what Netsuite Software Company did. It was their third time to be a part of ALKFI-BK initiatives. There were 30 volunteers from the HR Department of the company who joined the event. The employees had a germinant planting activity where they potted baby Cupangs that will soon be planted in the La Mesa Watershed. They also went to the Shell Flower Terraces where they did the weeding activity. The volunteers separated the undesirable weeds from growing flowers. Though they were tired from the activities, the volunteers enjoyed the event a lot. “We've been very actively in CSR but today, it’s different but very good experience siya. The actual experience the step-by-step planting is great to everyone although mainit, this one you really exert physical effort eh. Nagtanim ka, nagweed ka, naglakad ka so parang, you've given more of yourself to do the activity.” Ria Cejero, the HR Director of NetSuite Philippines and Thailand shared. Indeed, though tiresome, it is still a fun, exciting, and educational activity in maintaining our nature’s beauty and significance. Just as their T-shirt says: Netsuite Impact Team: Make a difference together!